I find this vintage ad both hilarious and adorable. I'm taking a day off to catch up on some work but I'll be back on Friday. I absolutely love it! The idea, the colours... Aaah my knitterly soul is aching for this! That is adorable! Also completely off topic....I just read your FAQ yesterday and I'm trying your hair tricks! Nothing seems to work on my hair...maybe the mousse will! Very cute! I'm using that exact color yarn for some Christmas craftiness around the house! Haha, that is amazing! I love it. I think I'm going to go into advertising someday. This add is kind of amazing! Enjoy your day off girl! 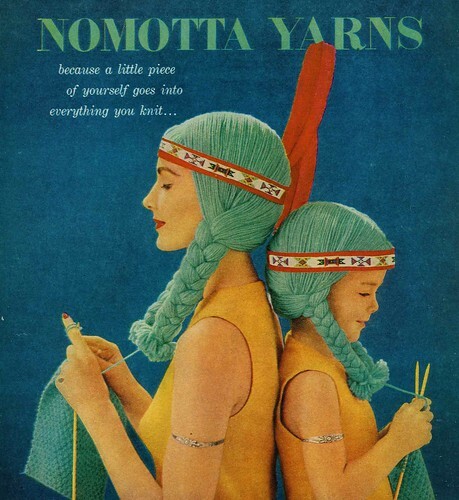 Love that ad....though I'd completely forgotten about until this moment, I made a bright red Raggedy Ann yarn wig in high school that was pretty similar (I wonder what happened to it). Love the colour of the yarn, too. I love that photo.....so awesome! lovely:) - and so true!